A tedious tale of fascist cabals, freemasonic conspiracies, perverts lurking under every cassock and a pope glad to invent a heroic past and preserve a hidebound one. 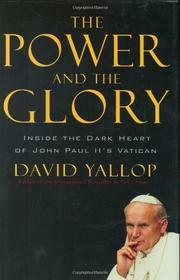 If you are disposed to think Catholicism evil, then Yallop’s book will doubtless please. The opening chapters rework his hypothesis, from In God’s Name (1984), that John Paul I was poisoned because he knew too much about the financial crimes within the Vatican and wanted to make appropriate reforms; John Paul II not only tossed aside those reforms, Yallop asserts, but also freed the gnomes to do as they wished, so that “while the Holy Father roundly condemned apartheid, the Vatican Bank was secretly loaning $172 million to official agencies of the South African apartheid regime.” The Vatican Bank, of course, was not the only lender to rightist regimes, and Yallop charges John Paul II with hypocrisy for ignoring the crimes of authoritarian and totalitarian regimes outside Eastern Europe. Strange behavior, that, considering that Yallop also asserts that the pope was no real enemy of communism and that the Polish communist regime was “instrumental in setting him on the path to St. Peter’s throne.” Much of the book is a lurid catalog of incidents of sexual abuse and pedophilia proven and alleged, with Yallop charging that the pope and his minions did nothing to stop the priests. Much of the rest is given over to charges that John Paul II invented and padded his resume; thus, “the claims made over many years about Wojtyla’s wartime actions on behalf of Jews are a fantasy without any foundation.” But this book has little grounding, either; lacking substantial documentation and reliant on supposed anonymous sources inside the Vatican subject to supposed curial inquisitions, it is an extended and rhetorically predictable rumor. And a grinding, aggrieved one at that. Will it prevent John Paul’s beatification? Not likely.